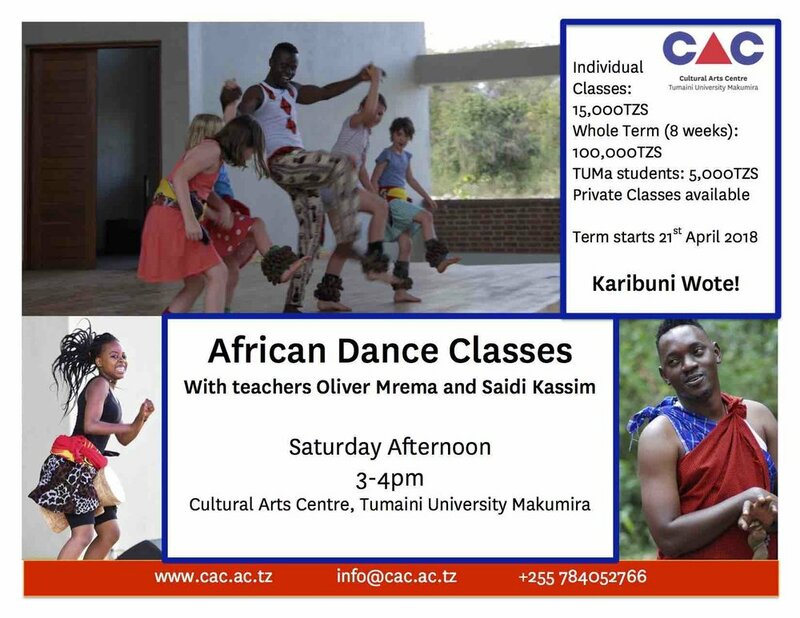 Our first term of dance classes has finished with teachers Oliver Mrema and Saidi Kassim (and guest drummers Abasi Mkomwa and Robert Mathew). We had some really dedicated students who learned to dance Ngokwa from the South of Tanzania, Mangaka from Kilwa, and Sangula from Morogoro amongst others. We have started a new term, with teachers Fatina Mwasha and Abasi Mkomwa. Karibuni wote! 15,000TZS per person per class/100,000TZS for a full term of 8 weeks. On the 6th of June we hosted the Amici Quintet, a professional wind quintet who were on tour from the USA. They played an exciting program with music from composers from around the world, including D'Rivera (Cuba), Piazzolla (Argentina), Poulenc (France), Danner (USA), Tamusuza (Uganda) and Still (USA). Difference ensemble arrangements were used, including a double bass and oboe duet, quartet with egg shakers, and a wind quintet featuring very own Programme Manager, Randy Stubbs, on the CAC grand piano. Around 100 students from Makumira University attended and had the opportunity to learn a little bit about the instruments that were being played. This year CAC provided the majority of the entertainment on the main stage at the combined exposition for tourist stakeholders, Karibu Kilifair, from the 1-3 June. It was an opportunity to showcase some of the varied talents of our artists, and we presented traditional dancing and drumming, a masked dance, workshops for children and adults in dancing, hiphop, and acrobatics (collaborating with 4 other local acrobats). CAC fusion band also provided the entertainment at the AMEG hotel on Friday evening, playing international and Tanzanian hit songs. With weeks of learning lyrics in English, Spanish and other languages they played favourites such as Hotel California (Eagles), Despacito (Luis Fonsi), Sura Yako (Sauti Sol), One Love (Bob Marley) and Loliwe (Zahara). A good night was had by all! Our stall in the fairground was also busy, both with people learning about the CAC and our activities, and people making music on the ngoma (drums), pembe (horn), kayamba (shaker) and zeze (stringed instrument) that we had on display to give people a taste of what they can see and do at the Centre. Our aim was to encourage more visitors to come along and try out the activities that we have on offer, and we were successful in that there was a buzz around the CAC. Hopefully some of these visitors will make it to the centre! OPERAtion Classics performed the Barber of Seville by Rossini at the CAC on the 21st April 2018. 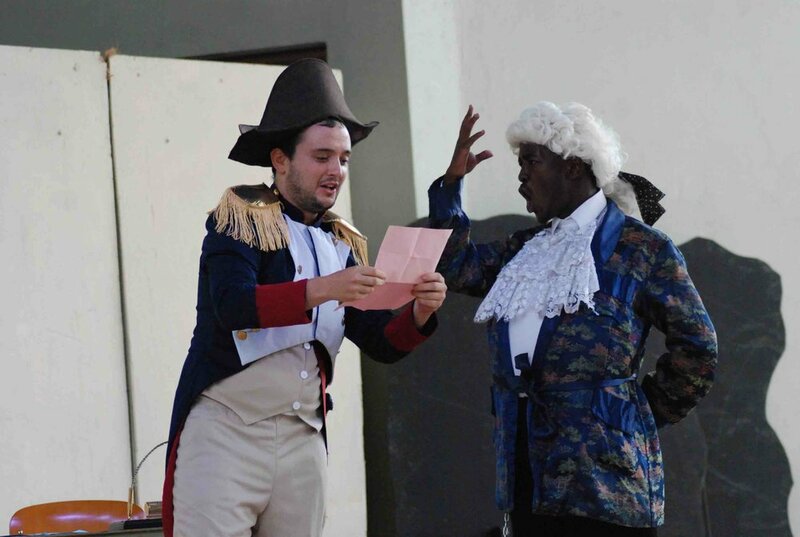 They were on tour from Nairobi, and did three performances in Arusha: in the TGT grounds, the Chai Bora Mansion, and in the CAC performance hall. The singers enjoyed singing in the CAC hall, as it is custom designed for musical performances, unlike the other places where they performed. 36 students and staff from the International School Moshi (both Arusha and Moshi campuses) spent three days at the CAC from 10-12 April 2018. They camped on our beautiful new lawn, and made use of the facilities at CAC including showers, bathrooms and kitchen. The workshops were all oriented towards the performance on the last day, and included learning to dance and play drums, a drama through dance, making drums, costumes and a backdrop for the stage, and a stage crew who did lights and sound engineering. New talents were discovered and new friends made from the different campuses, and the students also had the opportunity to develop classroom skills such as their Swahili, while it was all tied into the theme of arts and the environment that we live in. We look forward to welcoming them back next year!